This is one of my favorite homes in Brentwood. A friend's mother owned it for many years and sold it to McVie. Would love to find a buyer for the charmer!!!!! “Listen to the wind blow, watch the sun rise” from the Brentwood home of Fleetwood Mac bass guitarist John McVie. 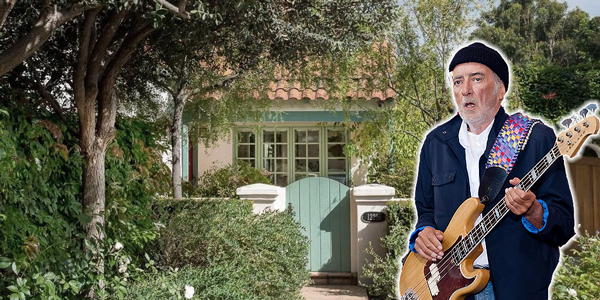 The musician listed his Spanish-style home with an asking price of $2.9 million, three years after purchasing it for $2.5 million. The 2,200-square-foot home has two bedrooms and three bathrooms, the Los Angeles Times reported. There is also a recently designed glass studio/guest house by architect Lise Claiborne Matthews with heated concrete floors, Moroccan tiles and a bathroom, according to listing details. The house on Shetland Lane was also the onetime residence of crime novelist Raymond Chandler. Marcie Hartley of Hilton & Hyland has the listing.